A baby is stolen. A young mother’s life is forever changed. A young girl awakens to all the things her mother has told her that she begins to question. Why is she never allowed to leave her house? Why do they move from town to town? Why is she hidden? Wow…I read this breathlessly. It was amazing. It was told in two of the most lovely voices I have read in a long long time. Sophie the lost daughter and Emmy the lost mother. Emmy never ever giving up the hope that her baby is out there somewhere. Sophie…finally living next door to an amazing loving odd family and beginning to yearn for truth while slowly growing up enough to give herself the courage to search for it. There are many lovely characters in this novel…Jimmy and his aunts and their pets…Harvey the dog and Minxie the cat who sits in Sophie’s lap as she sneaks there each day while her mother is at work. It is such a book of contrasts…beautiful voices and harsh voices…the images and tastes of homemade cookies and brownies against diner food brought home each day in stark white cartons for Sophie and her mother’s cold dinner. Each little ordinary bit of life that Sophie shares at the aunts’ house leads her one baby step closer to living her own real life. A lovely book. Memorable and hopeful. Moving and sad. Finally…wondrous!!! 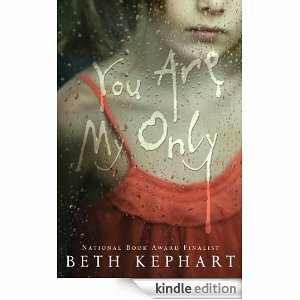 Thank you again, NetGalley and Lindsay…thank you again, Beth Kephart. Wow, sounds wonderful. I'll keep an eye out for it. I'm not surprised this was so good. Kephart has a way with words. I love it when pets assume important roles in the story as well. They really help round a book out, don't they? This reminds me about the real-life story that was in the newspapers this spring in NYC. The girl had been kidnapped as a baby. She starting investigating her origins when her “mother” refused to give her information about her health history when she was pregnant with her own child. She was ultimately reunited with her biological parents and the woman was arrested! Wow..I'm not sure if I could read a book about a stolen child. I think I would turn into that lost mother. This sounds so good and moving. Patty, thank you so much!! I never google my own name so I never know about these things. so thank you for letting me know. I am going to cross post it right now. I am so very grateful for this — so grateful, and I just cross posted it on my blog. A million thanks to you. I am so looking forward to this book. Glad you enjoyed it.